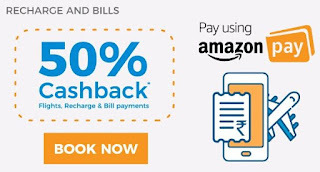 Komparify – Get 50% Cashback upto Rs 50 via Paying through “Amazon Pay balance”. 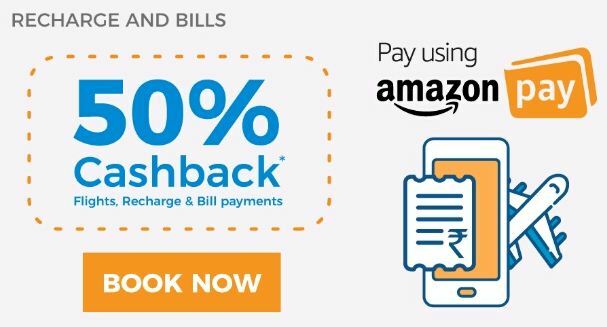 Amazon has come up in association with Komparify and offering flat 50% Cashback when you pay through “Amazon Pay Balance”. Offer applicable to first time Amazon Pay users on Komparify.The Offer is valid from 1st October, 2017 to 22nd October, 2017. So Hurry up and avail this offer now !! 2) Login/Sign up on Komparify. 3) Initiate a Recharge, Bill Payment or Buy Gift Voucher. 4) Choose Payment mode as “Amazon Pay“. 2) The Offer is valid from 1st October, 2017 to 15th October, 2017 both days inclusive (“Offer Period”), unless revoked or extended by Amazon in its sole discretion, without assigning any reason, without prior notice, and without liability of any kind. 4) (Each transaction meeting the aforesaid requirements being referred to as a “Qualifying Transaction”). 6) These Offer terms and conditions (“Offer Terms”) are in addition to the Gift Card Terms and Conditions. To the extent the Gift Card terms and conditions are inconsistent with these Offer Terms; these Offer Terms will prevail with respect to the Offer only. 7) Amazon reserves the right to disqualify any customer from the benefits of the Offer, at its sole discretion, if it identifies any fraudulent activity being carried out for the purpose of availing the benefits under the Offer or for any reason whatsoever. 8) This Offer cannot be combined with any other offer or promotion made available by Amazon on the Website. 9) This Offer can only be availed once by each customer. Additionally, and for the avoidance of doubt, Amazon Pay Balance will only be provided for the first Qualifying Transaction (and not for any subsequent transactions) made by the customer during the Offer Period. 10) Amazon reserves the absolute right, without prior notice, without liability, and without assigning any reason whatsoever, to add/alter/modify/change or vary any or all of these Offer Terms or to replace, wholly or in part, this Offer by another offer, whether similar to this Offer or not. 11) This Offer is valid for Indian residents only. 12) The Amazon Pay Balance will be sent to the registered email ID of the customer making the Qualifying Transaction within 72 hours of such Transaction.value or redeemed for cash, except to the extent required by law. 2) The Offer is valid from 16th October, 2017 to 22nd October, 2017 both days inclusive (“Offer Period”), unless revoked or extended by Amazon in its sole discretion, without assigning any reason, without prior notice, and without liability of any kind. 9) The Amazon Pay Balance will be sent to the registered email ID of the customer making the Qualifying Transaction within 72 hours of such Transaction. 10) Amazon Gift Cards will expire one year from the date of issuance by QwikCilver. Amazon Gift Cards cannot be used to purchase other gift cards. Amazon Gift Cards cannot be reloaded, resold, transferred for value or redeemed for cash, except to the extent required by law.